In total the Cobra MT975 PMR446 two way radio has 8 separate channels with another 121 privacy frequencies on them. 2 x Cobra PMR MT975 Radios. FEATURES - 8 Channels, Up to 12km Range! As I have lowered the price to clear them up. Cobra MT245 twin pack diverse array of portable and mobile two way radios and pagers offers solutions that better enable you to efficiently coordinate and communicate with your on the go workforce. Communicates with all other PMR 446 radios Up to 5 km range Compact design with extended range. Roger beep Confirmation tone indicates to others it’s clear to talk. Power saver circuitry Unique circuit extends battery life when not transmitting or receiving. Call alert Provides a recognizable alert for incoming calls. Micro-USB Charging Capable Rechargeable batteries can be charged inside the radio. 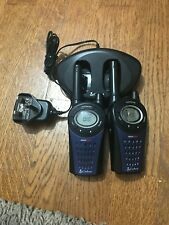 A set of two Cobra MT645 Walkie Talkie Radios. Cobra MT645 is one of the best 2-way radio sets on the market. Up to 8km range. 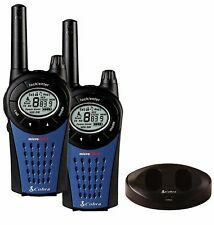 Communicates with all other PMR 446 Radios. There are 8 Channels, 121 Privacy Codes and 968 Privacy Combinations. AM1035 Walkie Talkies. 2 AM1035 Radios. 12km Signal Range. The all new 12km Walkie Talkie from Cobra. This Floating waterproof radio allows you to be ready, whatever the weather. Up to 968 channel combinations are available when the 8 channels are combined with the 121 privacy codes. PART NUMBER: AM1035 FLT. AM1035 FLT- Pair of Black/Orange 12km walkie talkie radios. This Floating waterproof radio allows you to be ready, whatever the weather. Height: 191mm. 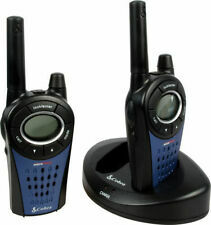 2 x two-way radios (model: AM1035 FLT). The Cobra Adventure AM1035 FLT is water resistant, allowing for continued use in adverse conditions, including heavy rain and snow. Signal range up to 12km. ModelAM1035 FLT. 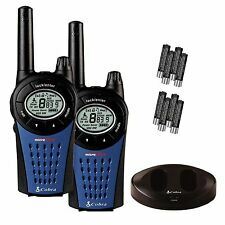 Cobra MT 975 Walkie Talkie Radios. The applications of the Cobra MT975 are countless. COBRA MT975 Specifications. Cobra Communicates with all other PMR 446 Radios. 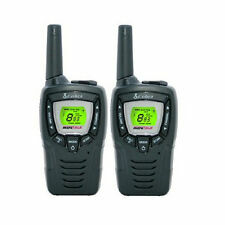 2 x Cobra MT975 Two Way Radios. 12KM Range / 7.456 MILES ! 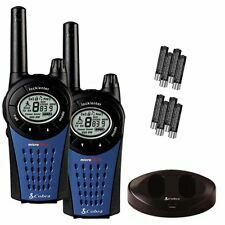 For sale is a set of 14 Cobra MT 975 10 Channel Two Way Radios with 6 charging bases. Ideal for a motorcycle training school (where these were used) or a scouts troop etc. All in fantastic working order. Save a fortune on manufacturers rrp - these are superb radios. AM1035 FLT. PART NUMBER: AM1035 FLT. Part Number AM1035 FLT. 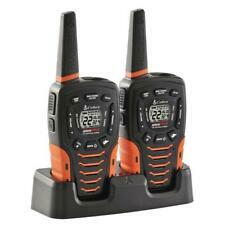 AM1035 FLT- Pair of Black/Orange 12km walkie talkie radios. This Floating waterproof radio allows you to be ready, whatever the weather. Depth: 38mm. 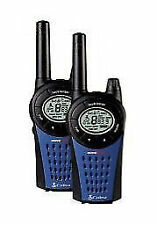 Cobra microTALK MT800 Twin Two Way Radio. Condition is Used. Dispatched with eBay delivery – Shutl 2-3 days. Both handsets complete with charger and instructions. Donated into the school. Condition is Used. only one handset. Roger beep tone. Range extender button. used but in very good condition. Illuminated LCD. written on back : maximum 3km range. The Cobra AM1035 communicates with all other PMR 446 radios, so you can add this to your collection or get linked up with your friend's radios. With its floating design, the Cobra AM1035 is IPX7-rated waterproof so it can be used in adverse weather and around water sources. Also with a VOX mode the Cobra MT975 can be set to transmit as soon as it detects your voice, so you don’t even have to press any buttons. In total, the Cobra MT975 two-way radio has 8 separate channels with another 121 privacy frequencies on them. Also with a VOX mode the Cobra MT975 PMR446 can be set to transmit as soon as it detects your voice, so you don’t even have to press any buttons. FEATURES - 8 Channels, 121 Privacy Codes, Up to 12km Range!